Learn how to use Pinterest to drive more traffic to your blog or online business! After 4 blogs and 6 years into blogging mainly just for fun, I can say that blogging has changed drastically over the past 6 years. Nowadays everyone seems to have a blog and it’s not as easy to get your content seen by others, especially by your ideal audience as it used to be. However, with the change of time also new, amazing opportunities emerged for bloggers. It has never been as easy as today to start a business with a small capital and to earn money from home by doing what you love. You can set up a blog relatively quickly and just for a few bucks and start sharing your content with everyone around the world. The only problem bloggers are facing today is to drown in the noise of the internet and not be found and seen by their ideal audience. The solution is not letting them find you, but you going out and find them. The best way to do so is by using Pinterest wisely. Honestly up to 2017 I didn’t know about the power of Pinterest for bloggers. Since then I’ve taken 6 Pinterest courses and learned a lot about this amazing tool. In this post, I give you a step by step guide on how to get started with Pinterest. Think of Pinterest as a huge platform where you can have several bulletin boards with the topics you care about. All nicely organized not on your wall at home but on your Pinterest profile. 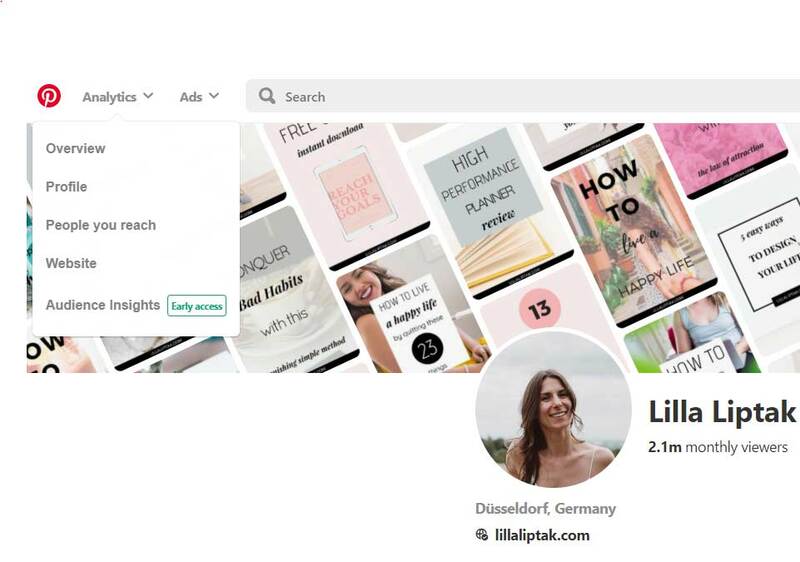 You search the topics you are interested in via a search bar on Pinterest and pin the pictures (the pins) to your selected personal boards. These pins are connected to a website. Which means you not only have the pictures on your boards but also the opportunity to go to the website and to get more information about the pictures = about the topic you are interested in. For example, you pin a delicious smoothie on your board click over to the website where it’s from and probably have the recipe of this smoothie at a glance. By implication, this means for you as a blogger and business owner that you can create articles for your ideal audience + matching pins and distribute those pins on Pinterest. Whenever people find your pin, love it and click over to your website you get free traffic to your site. Pinterest is a social media platform however totally different from Facebook, Twitter, and Instagram. Actually, Pinterest doesn’t want to encourage socializing on the platform as Facebook and Instagram wants to. 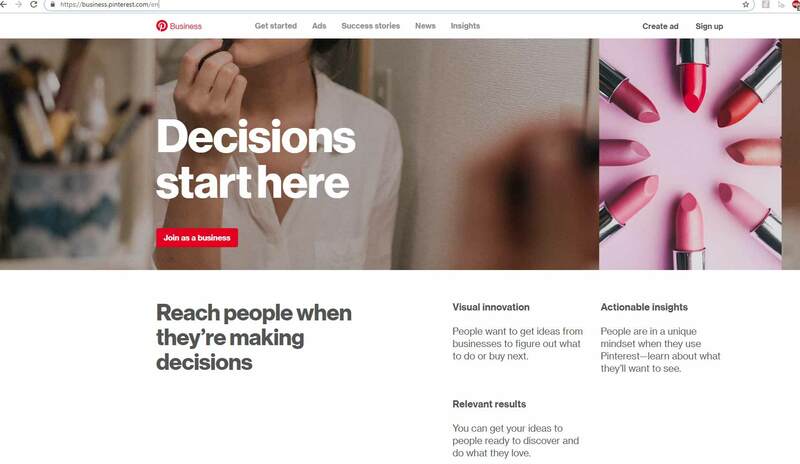 At Pinterest, it’s more about giving and getting inspirations and ideas. For example inspirations for outfits, home decor, healthy living, intentional living etc. and ideas to try out in form of recipes, DIY projects, crafts and so on. Unlike any other social media platform with Pinterest, you have the chance to upload a pin and let this pin circulate for months and years to come. This means free traffic to your website even long after you’d published the post and uploaded the pin. You pin it once, someone else likes it and repins it on his/her board (=shares it), another person shares it from there and you reach with your pin people from all around the globe. It can get distributed very quickly and your content won’t get lost in the feed just a few minutes after sharing it as it’s the case with Facebook or Instagram. Pinterest is a very fast growing and strong platform. There are over 250million monthly active user on Pinterest looking for inspirations and ideas to try each and every single day. It’s currently mainly dominated by women however the male sign-ups are increasing. Pinterest is a search engine and just like Google uses keywords to get the content in front of the right audience, so does Pinterest as well. However, Pinterest operates slightly different to Google as it is a visual-based search engine. Which means that Pinterest doesn’t only care about the keywords on the pin and in the pin description but also pays large attention to the pictures on the pins. It uses all three, the picture on the pin, the text on your pins and the pin description to figure out what your content is all about. So it’s very important to have all 3 of those matching to your topic and be well keyworded for maximum results. Having a keyworded picture with keyworded text on it + keyworded description and a descriptive picture, Pinterest knows who might be interested in your content. It shows your pin to the person who searches for it. On Pinterest, you can have a personal and a business account. It’s possible to keep both. Unlike to Facebook, you can have several accounts on Pinterest without being banned. You can also convert your existing personal account into a business account if you like to. I personally have a personal account for years and started with zero followers and zero pins in April 2018 with a business account. With a business account, you have access to your analytics. 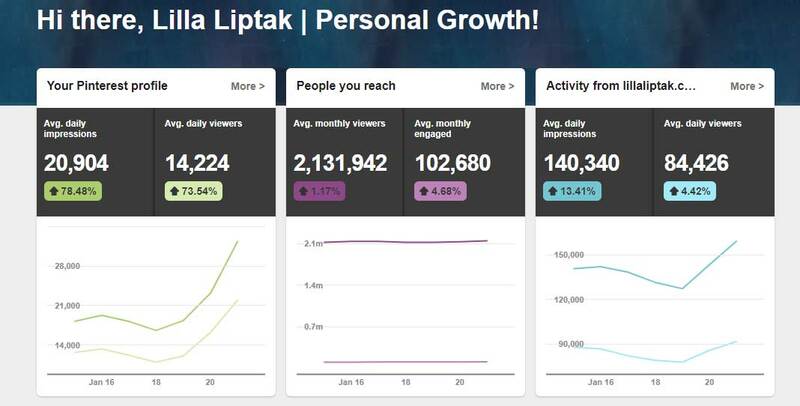 You can see your monthly reach on Pinterest, the most shared and most clicked pins you upload to your boards and more. This can help you analyze which pins are doing good and create + distribute more of those. I would highly suggest creating a business account. The reason being: you want to pin to your business account the things your ideal audience is interested in. Leave all your personal stuff on your personal account. This way you won’t confuse Pinterest. With a business account, you have access to the Analytics of your profile. When you click on Analytics and then to overview you can see how your profile is doing in general on Pinterest. Click on Analytics and profile and you can see your most popular meaning most shared and your most clicked pins on Pinterest. When you click on Analytics and people you reach you can see how many people you’ve reached in a given time in this case in 2 weeks. By clicking on Analytics and website you can see your most saved, most clicked and the best-performing pins from your website. Setting up your business account is as easy as a walk in the park. You need a separate email address for your business account though, in case you already have a personal account. Go to Pinterest and simply click on the button Join as a business. After clicking this button you’ll see a sign-up page where you can enter your email, password, business name, business type, and your website (if you already have one). Once you signed up Pinterest will show you 5 topics to choose from so they can create for you a custom home feed. After that, you’ll be taken to a page where you can download the Pinterest browser button. In order to pin from your website, you have to verify your website on Pinterest. After you verified your website apply for rich pins. Include more than just your business name, add a niche relevant keyword that describes what your blog is about. This will help boost your SEO on Pinterest. Write in the about me section what your blog is all about. Add relevant keywords, but try to avoid keyword stuffing. It should sound natural with a few keywords sprinkled in between. The bio is limited to 160 characters so make it sweet and simple. What you do, who it’s for + a call to action. 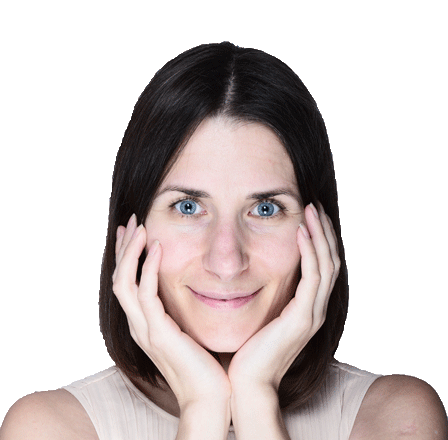 Instead of a logo try to use a friendly picture of yourself to represent your brand. Ideally, your Pinterest username is the same as the name of your business. From a brand perspective, it’s best if your username is the same on all social media platforms. 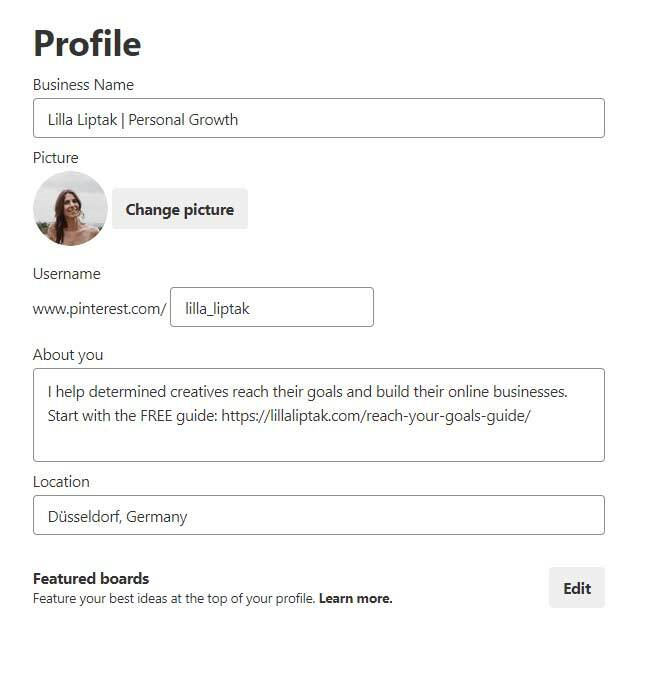 Just as your business name you can also change your username later on Pinterest if you like to. Create a few boards (15 to 25) with topics related to your niche. Make sure to give your boards a proper keyworded name people would actually search for on Pinterest. The board name and description should be both descriptive for what the board is about and include relevant keywords. Again Pinterest is just a machine and only knows what you are all about according to your keywords. There is a lot of information circulating out there where it’s suggested to have business and personal boards on your business profile. But I’d suggest to just go with the business stuff on your business profile and have a separate account for your personal stuff. 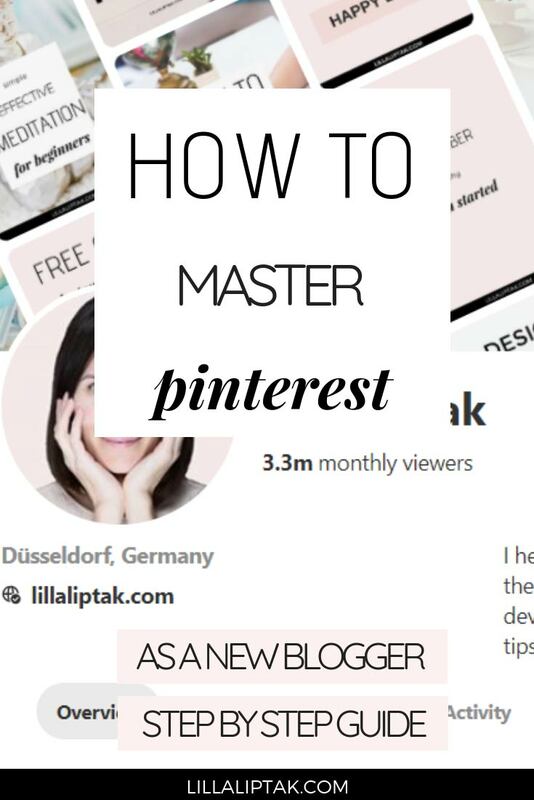 If you mix too many of your personal interests with your business stuff (I made this mistake in the beginning) Pinterest doesn’t know what your content is all about. I, for example, am blogging about personal development and building an online business/blogging. This is what my readers are interested in, but in the beginning, I also had a board called mom life, recipes and kids crafts on my business profile. Pinterest got confused what my Profile is all about and people started following me for kids crafts and mom life stuff although it’s not what my site is about. Pinterest pays attention to the quality of your followers. The more engaged they are with your content the better in Pinterest eyes. You don’t want to confuse Pinterest. Be clear what your profile is all about and pin your personal stuff which has nothing to do with your business to your personal profile. Each of your boards will have a board cover. Therefore you can use your existing pins from that board as a board cover or you can create branded covers for your Pinterest boards. I personally have branded covers for my Pinterest boards, but you don’t have to do that. The size I used is 300px by 300px. For creating the covers you can use for example Illustrator,Picmonkey or Canva. In case you don’t have Illustrator or don’t know how it works I’d recommend checking out picmonkey and canva. They are both much cheaper. Canva even has a free version which is totally fine in the beginning I’d say. After creating 10-25 personal group boards (the number of personal boards you create is up to you) it’s time to search high-quality group boards. Contrary to personal boards where the only pinner is you, with group boards you have several contributors on board. A group board is basically a personal board someone turned into a group board by inviting contributors to it. As a newbie on Pinterest with little own content and no followers at all the best way to get your pins seen by others are by joining relevant group boards and tailwind tribes. Group boards are boards on Pinterest where several people are allowed to pin to it. You can recognize a group board by the little round icon below. Whenever you see several contributors it’s the sign that it’s a group board. When you click on that board you can see what this board is all about and whether it fits your niche or not. Sometimes they have an email address added to the description where you can apply and ask as to be added as a contributor to the group board. As you can see this group board has over 28k followers. This means whenever you pin your pin to that board there is the chance that a lot of ppl will see it. Which is awesome especially when you’re just starting out. Usually, there is the rule that for each pin you contribute you have to pin another pin to your own boards. This is to keep the group board active and powerful in Pinterest eyes. Every group board has different rules. Make sure to read them before applying as a contributor and to keep those once you are accepted as a contributor. You can find group boards by typing in your field of interest to the search bar on Pinterest and by selecting boards. In this example, all personal and group boards with the word mindfulness in it will show up. Now you can check out all boards and see if you find one you want to join. Another even better way to find group boards is by using the platform Pingroupie or the platform Pinsprout. You simply type in the category you are searching for in this example “Health” and it’ll show you all the health-related group boards on Pinterest. What’s great about Pingroupie and Pinsprout is that with both you can see not only the number of followers, contributors and what the board is all about but you also see the repin rate of the pins pinned to the boards. This is a great indicator of whether the group board is of high quality or not. You want to join high-quality group boards where the repin rate is high in order to succeed with Pinterest. To join the group board you simply click on the title of the group board (which is a hyperlink) and will take you to the board. Before you are joining any group boards make sure if the pins are high quality and matching to your brand + what the rules of the boards are in order to pin on it + how to be added to the group board. If there is an email address you follow the instructions if there isn’t any you click over to the profile of the creator go over to their blog and send them a private message. In order to be added to group boards you have to follow the creator’s profile and the group board you are applying to be added. Now I’m honest with you and tell you upfront that it’s really difficult to join as a new blogger high-quality group boards. Most of the times you won’t even get an answer and won’t be added. Because people who have tons of followers and high-quality group boards don’t see any value in adding a new blogger who they don’t know to their amazing board. Apply later to be added to the group board again, once you’ve got more follower. Apply for crappier group boards, in the beginning, to get started. Or the option which I personally think is the best in combination with 1 = to join tailwind tribes. Another way to get your content in front of other people and to find good content to share is by joining tailwind tribes. You can use their tribes’ feature for free. You may join 5 tribes and upload up to 30 pins per month with a free account and on a plus plan as well. Seriously this is my favorite! Tailwind is a Pinterest approved scheduler. Similar to group boards on Pinterest it has the so-called tribes, where you can add your content and share other people’s stuff. 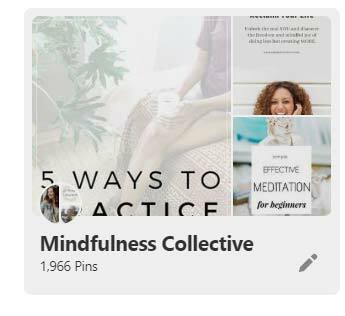 Make sure to not just check out the pins and randomly share them whether on Pinterest or in tribes but to actually also click on the pin and to see what the content is all about and where the content is leading to. Sadly there are a lot of spammers out there, pin theft is happening and you can only make sure the website isn’t blocked or spammy by checking it out before you are pinning it to your boards. Pinterest doesn’t like blocked and spammy websites and will show your content to fewer people if you pin those sorts of pins. Because it will associate your account with these spammy, blocked sites. You don’t want that to happen. Besides using their tribes you can see the performance of your pins and can schedule your pins to Pinterest via Tailwind as a member. Here is an example of 1 of the tribes I’m in. 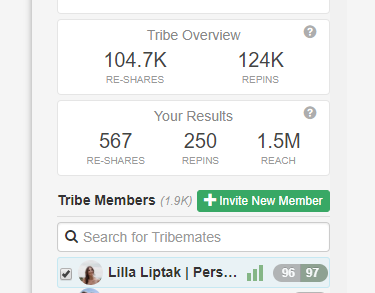 I shared 96 of my pins which resulted in 567 re-shares from tribe members, 250 repins on Pinterest and 1,5 million people I could reach. In my opinion, if you want to grow your presence on Pinterest tailwind is the way to go! You can start generating traffic to your blog from day 1 by using tailwind for your Pinterest account. All you need is a website with blog posts and pins to share on tailwind. You can sign up for a 14 days free tailwind trial here. There is a rule of thumb to pin in the beginning 80% of other peoples content and 20% of your own. Some people don’t do this they have a 50% 50% ratio or less. I personally did the 80/20 in the beginning because I didn’t have that many blog posts written at that time. Over time I decreased it to 50% 50% and even much less than that because I have way more content to pin, I don’t pin so many pins per day and mostly I pin them to my own boards. There is information out there saying that you need to pin 50 to 100 pins per day. In case I try another method and see more success I let you know. What you should be more focusing on is being consistent with pinning. Try not to skip even one day. If you are to busy to pin each and every day from Pinterest again Tailwind is the way to go. Tailwind has a smart schedule feature meaning it’s posting your pins at optimized times to your selected boards = when your audience is most active. You can set up your schedule even a couple of months in advance and let Tailwind to the work for you. Picmonkey is easier and cheaper than Illustrator and Photoshop. It has many design possibilities and it’s a great tool to create unique pins and printable products. Canva is another tool to create pins and free gifts. It has fewer possibilities in terms of individual design compared to Picmonkey but is very easy to learn and has a free version. Pingroupie is the site where you can search for high-quality Pinterest group boards. It’s free to use. Pinsprout is another great website to find high converting group boards. It’s free to use as well. Tailwind is the smart scheduler you need to stay consistent with your pinning schedule on Pinterest. It has also the feature of tribes which are similar to group boards. However, it’s much easier to get into a high-quality tribe than into a good group board. You can try tailwind 14 days for free. Want to learn more about how to rock Pinterest? 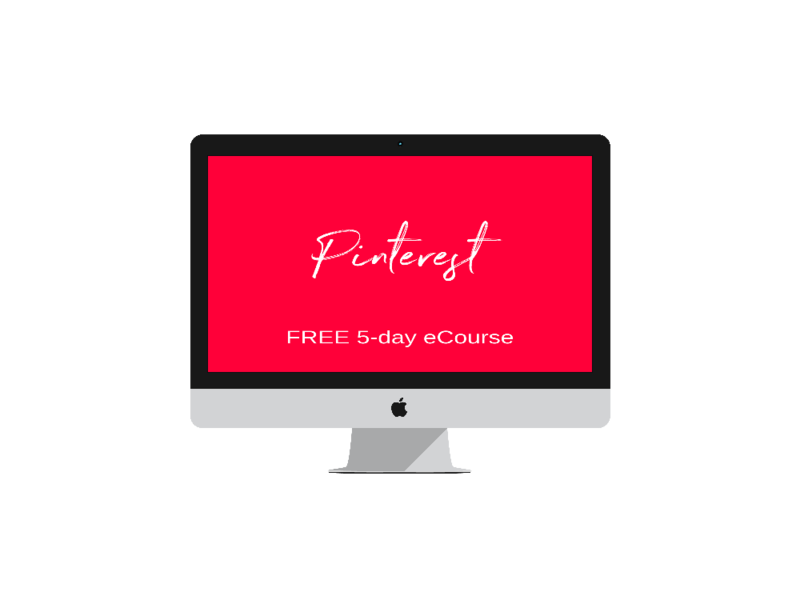 Sign up for the FREE 5-Day online training and learn how to generate tons of traffic to your new blog from Pinterest!